Registrations are now closed. The event will be streamed live from UNPO's Facebook. 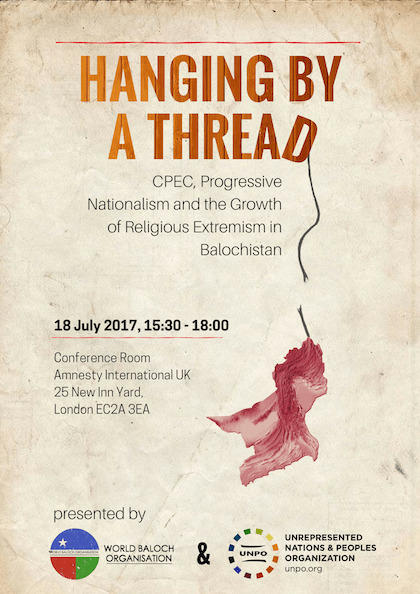 On 18 July 2017 at 15:30 the Unrepresented Nations and Peoples Organization (UNPO) in collaboration with the World Baloch Organisation (WBO) will organise a seminar at Amnesty International UK entitled “Hanging by a Thread: CPEC, Progressive Nationalism and the Growth of Religious Extremism in Balochistan”. The interactive seminar will aim to provide a platform for a critical discussion on the future of Balochistan. Pakistan’s long-term campaign to crack down on its indigenous populations and ethnic minorities has been depriving the most fundamental rights of the Baloch people for decades. However, in international media channels the Baloch’s peaceful struggle for justice, rights and equality has often been misconstrued and reduced to a violent secessionist movement. The growing sectarian violence and religious extremism in Balochistan - the country’s largest yet least developed province - can largely be attributed to the support provided by the Pakistani army and intelligence agencies, which aim at undermining the Baloch nationalist cause and the authority of its nonviolent and progressive leaders, as well as neutralising Baloch human rights activists and any foreign pressure to stop Pakistan’s gross human rights violations. The US$46-billion-dollar mega project known as the China-Pakistan Economic Corridor (CPEC) has excluded any legitimate local representative from decision-making processes and silenced any peaceful opposition to the project. The mammoth infrastructural project will connect Balochistan’s deep-water Gwadar port to China’s Xinjiang, providing Beijing with access to the Arabian Sea. Yet, despite Balochistan’s key geopolitical location and promises of development and employment to the region, none of these have materialised as jobs have been given to the massive influx of Chinese personnel in the region. Moreover, the campaign to implement CPEC has been ruthless, with local inhabitants forcefully cleared and armed forces raiding the houses of Baloch activists, as part of a larger campaign to ensure that the construction of CPEC goes on undisturbed. Islamabad’s long-standing history of promoting religious extremism to instate instability, especially in areas at risk such as Balochistan, points to an urgent need to open a dialogue on how to curb this vicious cycle. Against this background, this seminar aims to raise awareness of the heinous human rights violations being committed in Balochistan and to discuss how to best curb religious extremism in the region. At a time when independent media and international civil society organisations are repeatedly being denied access to Balochistan, the seminar will contribute to filling the existing information black hole and to draw international attention to these crimes. The event will bring together academic experts and renowned human rights advocates to discuss the challenges and interests at stake, and to look at how the international community can support the Baloch people to end atrocities commitment against them. You may find the conference programme here.